Sesamum plants are a genus of half hardy annual herbs that reach from 30 to 90 cm in height. They bloom in the summer carrying tubular flowers of violet, pink or white. 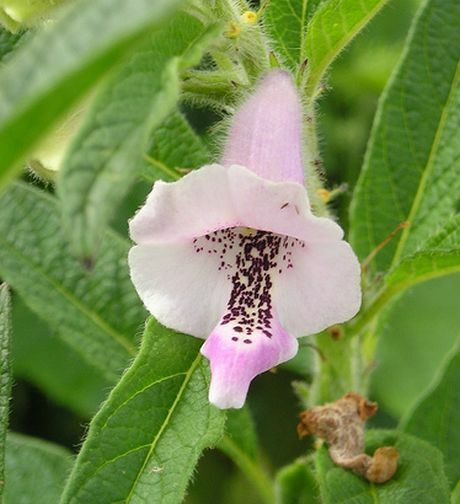 Some of the common names for members of the Sesamum genus include Sesame and Benne. To harvest Sesame seeds, the stalks should be cut off when the top seed pods have turned green, but before the bottom pods have opened (try to cut the stalks when it will result in a better harvest). 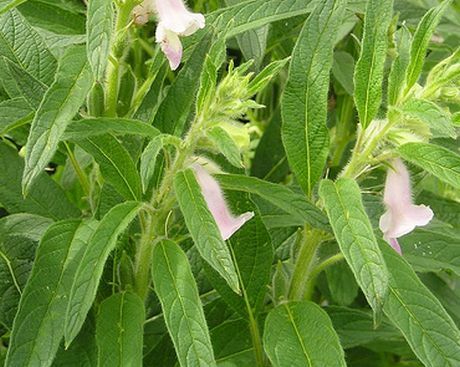 The sesame plant should then be put into a paper bag and allowed to air dry. Rub the bag to release the sesame seeds, and store them in a Tupperware container. Height: 20 to 40 inches (50 to 100 cm). Flower Details: Pink, yellow, blue, white, violet. Speckled. Tubular. Four lobed mouth. Sow Outside: 1/4 inch (6 mm). From the middle of spring; temperature should not drop below 60°F (16°C). Spacing 10 to 12 inches (25 to 30 cm). Sow Inside: Germination time: up to one week. Temperature 70 to 80°F (21 to 27°C). Two months in advance. From the middle of spring; temperature should not drop below 60°F (16°C). Requirements: Full sunlight. Good drainage. Miscellaneous: Oil rich seeds. Nutty flavour. 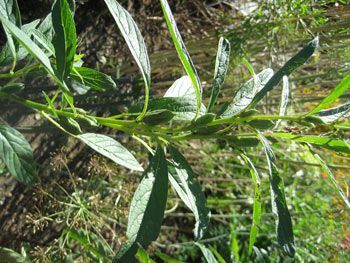 High in magnesium, calcium, and the vitamins B and E.
The seeds of Sesame, Benne, and other Sesamum plants should be sowed outdoors at a depth of 6 mm, about 25 cm apart. Do this towards the end of spring when temperatures remain above 15 degrees at night. It should take about a week for the seeds to germinate once temperatures reach 20 to 30 degrees. Ideally the sesame plants should be grown in a sunny area of the garden that is well drained; the soil type is not important. 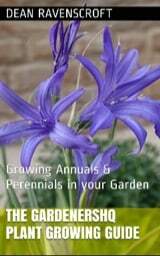 If you plan to start indoors then sow about two months before due to be transplanted outdoors (end of spring).